Does the third film in the series stand tall next to the other two? 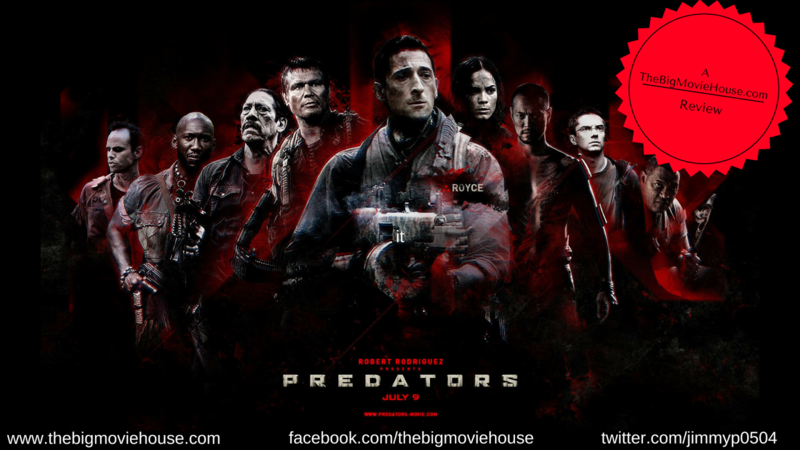 It has been twenty years since we have gotten a real Predator movie. The AVP movies don't count as they are not true Predator movies. Since Predator 2 's release in 1990, we have seen the original and the sequel got multiple video releases, including the much debated second blu-ray release, but we have not gotten a true Predator sequel. Well the time has come and the sequel is good. Earth's top killers are drop into the jungle without knowing how they got their. Eventually there are eight of them, including Adrian Brody, Danny Trejo, Topher Grace, and the guy with big teeth from The Shield. They figure out that they are on a different planet and that they are being hunted. Laurence Fishburne shows up about halfway through the movie, but his scenes are so unnecessary that we are glad when he is taken out. Fishburne does provide some crucial information, but his scenes bring the movie to a dead halt. He is supposed to be a person who has survived the hunt and has gone a little crazy, but he serves no purpose to the movie. Other than this diversion to the story, the movie moves at a very brisk pace and has plenty of action scenes. I really liked how director Nimrod Antal kept the movie interesting by keeping the formula very close to the original. Instead of hunting humans of earth, the predators are importing them to their planet. It gives the movie a different but oddly familiar feel. Antal also keeps the editing to a minimum and not going berserk. You can tell what is going on at all times and you never get lost. Antal could have gone MTV with the editing, but then it wouldn't feel like a Predator movie. It would have felt more like AVP. There is one other thing that bothers me and that is the plot twist at the end. The movie goes great and even follows the story arc of the original to a fault, but the filmmakers have decided to throw a plot twist in towards the end. Why? The plot didn't need any spicing up so why include this? It adds nothing to the story and only serves to frustrate us. I really liked Predators . Outside of the two minor complaints that I have, I had a really good time watching this. The movie isn't as gory as I had hoped it would have been, although there is a character that get a really good death. The movie is made with the same spirit as the original and that counts for a lot. Predators is one of the best movies of the summer and may land in my top ten at the end of the year.